A uniquely colored tree is perfect for any season. Because of their contemporary designs, you can choose to put them up all year-long. As we celebrate May 4th today, we’d like to revisit a post our friends from the galactic empire shared. The 1/6 Legion featured a Black Gold Ombré Tree which totally impressed Lord Vader and brought him back to his childhood. This holiday season, there’s more to love at Treetopia! We love how our fashionable trees allow anyone to express their personal style and individuality, so we’re thrilled to present these exciting additions to our growing collection of high-quality artificial Christmas trees. In this article, we share fun and fresh tree designs that fit in perfectly with the vibrant look of today’s contemporary homes. Faced with the problem of limited floor space, some homeowners settle for miniature Christmas trees, or even forego them altogether. Don’t let a small studio or crowded apartment cramp your holiday style. Treetopia’s pencil Christmas trees are designed with a slimmer silhouette, so they slip comfortably into spaces where conventional full-sized trees can’t. It’s always great to find super creative bloggers who are as passionate about Christmas trees as we are. Recently, we were tickled pink to be mentioned in a Halloween tree blog post by Jennifer Perkins. Jennifer is a talented designer and crafter with an incredibly rich, eclectic style, an obsession for kitschy collectibles, and a great love for throwing outrageous Halloween parties. 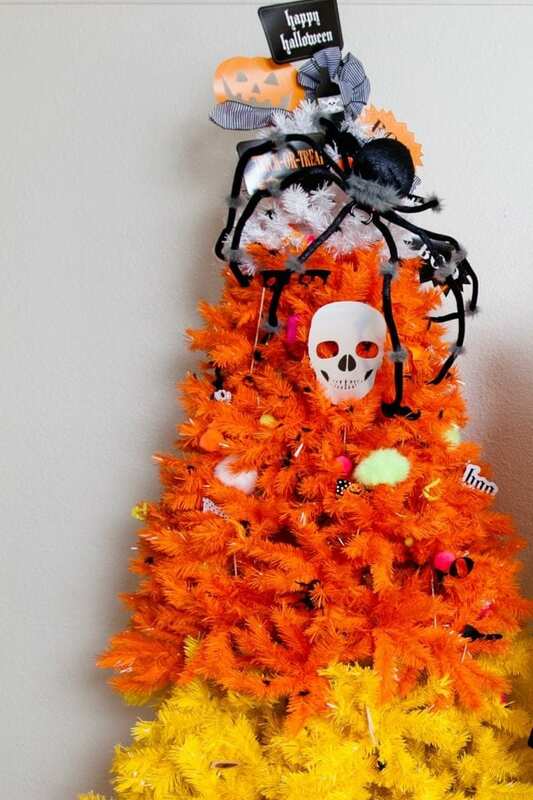 So when she wrote about how amazing a Treetopia Candy Corn Christmas Tree would look at her next Halloween bash, we just couldn’t resist! Here’s the utterly sweet and spooky result. Color is a pretty powerful thing. It can affect how we behave, change the way we think, and define who we are. It can even shape the person we want to be. This is why Treetopia artificial Christmas trees come in so many colors and shades. More than just an obligatory Yuletide accent, our trees provide people a beautiful way to express themselves during the holidays. If you believe that your home is an extension of your lifestyle and individuality, then wouldn’t it be great to find that one tree that best reflects your personality? From traditional green to vibrant orange to dazzling gold, read on and find out which colorful Christmas tree is perfect for you. Long associated with passion and desire, red is perfect for people who are strong-willed, ambitious, flashy, and energetic. Choose our exciting Lipstick Red Christmas Tree and have a fun and flirty holiday. Learn how to bring out the full beauty of your Treetopia Christmas tree with Treetopia’s Design Council 2013. In this series, we invite expert design bloggers to decorate their favorite Treetopia Christmas tree and share the fabulous results with us. Be inspired and discover the fine art of Christmas tree decorating with these terrific tips and amazing advice straight from the pros. We kick off our series with the elegant work of Michael Wurm, Jr. from Inspired by Charm.